Nexonia Inc., today announced full worldwide availability of their complete Android mobile expense report client for Nexonia’s subscription-based web expense management solution. Nexonia Expenses for Android allows Android users to enter and track expenses, take pictures of receipts and then submit their expenses at the tap of a button. Additionally, all expense reports, receipts and modifications made with this native application will synchronize and be part of Nexonia's innovative subscription-based web-based expense management solution. “Nexonia Expense for Android is the ideal solution for Android-carrying business travelers on-the-go because it’s secure, user-friendly and feature rich. We made it a first class mobile client and with exactly the same feature set as our strong iOS (iPhone, iPad) solutions,” said Neil Wainwright, CEO of Nexonia. Nexonia currently offers their web-based, expense report solution to thousands of users around the world. Applications are supported on all modern browsers running on Windows®, Mac® and Linux. Nexonia seamlessly integrates with Microsoft, SAP, Oracle, Intuit QuickBooks, NetSuite, Sage and a host of other accounting solutions. Nexonia’s Expense Reports for Android is freely available from the Android Market on the phone or on the web at the Android Market. 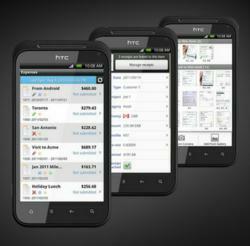 For more information on our mobile solutions please visit us at http://www.nexonia.com or watch our YouTube video. Nexonia is a highly advanced expense report tracking application built specifically for the demanding needs of organizations that need to enter, approve, manage and analyze their expenses. Nexonia is fully hosted, managed and backed up. There is nothing to install and it works on all commercial web browsers (Internet Explorer, Firefox, Safari, Chrome and any other advanced web browser on PC, Mac & Linux). For more information, visit http://www.nexonia.com.